DEF CON 26 just ran us over like an angry Mack Truck. To make it all better we brought along our favorite tech support guy and Earth Rocker – Neil Fallon. It might not come as a shock to you that we here at SEORG love Neil Fallon and Clutch. Having Neil out at DEF CON was an amazing experience. 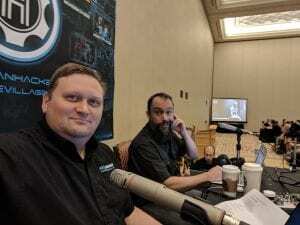 After 4 long days at DEF CON we hosted our annual live podcast for Episode 108. Neil fixes Chris' technical issues.